Today I have a post relating to my Global Issues Novel Study. 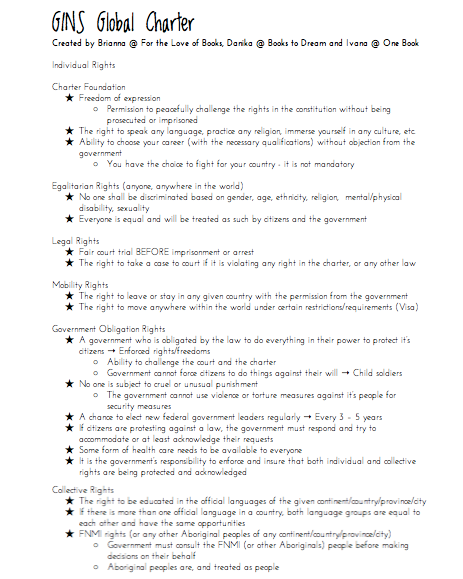 As to explore further into our current study of Canada's Charter of Rights and Freedoms, along with a few others, we created a charter to apply to our entire globe. Because we all read different novels, we were all able to contribute our different ideas spurred by the issues happening in the country we were reading about. Below you can see our document that we came up with. My novel, War Brothers by Sharon E. McKay, takes place in Uganda. Many of the laws in our charter were inspired by the situations that have occurred there. In the Canadian charter, we also have equality rights, which state that we are all equal. However, they say that we will not be discriminated based on age, gender, religion, ethnic origin, or mental/physical disability, but they don't mention discrimination based on sexuality. In Uganda, they passed an Anti-Homosexuality Act, and to prevent this type of behaviour, we included sexuality in our equality rights. Another specification we made that is not in the Canadian charter is the fact that you have the right to peacefully challenge the laws in the charter without being accused of treason, unlike that of the Ugandan constitution. Though we were inspired by several things in the Canadian charter, because we felt like they were fundamental rights that are critical to a fair and just country, we also added our own rights, particularly in the Government Obligation Rights. We created this section because we found that in many of the countries from our novels, the government was not upholding their end of the bargain. Even if certain laws are in place, the government does not always follow them. One major law we included in this section was the fact that the government cannot turn a blind eye to it's citizens, and also the fact that the government cannot use violence against the citizen's. We also included mandatory health care, because though that is usually a government choice, so many people in Uganda have died of AIDS that we thought it prudent to include it. Along the way, my group and I had little to no disagreements. We all agreed on the rights that should be included, except for one misunderstanding. We were discussing collective rights, language education rights in particular, and we misinterpreted something Brianna said as to mean every country should have a school with every language someone's first language is. However, this was a miscommunication and in truth she meant a school in which a large group of people in the province, state, or region needed schooling in that language. After doing this activity, I also consulted The Universal Declaration of Human Rights, a global document created by the UN. There were several things listed we had considered, but there were also some things I had never even thought about. For example, marriage. Below is the exact Article 16 from the Universal Declaration: "(1) Men and women of full age, without any limitation due to race, nationality, or religion, have the right to marry and to found a family. They are entitled to equal rights as to marriage, during marriage and at it's dissolution. Thanks for reading this post! Have a lovely day.